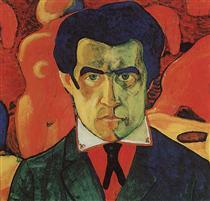 Kazimir Severinovich Malevich (February 23 [O.S. 11] 1879–May 15, 1935) was a Russian avant-garde artist and art theorist, whose pioneering work and writing had a profound influence on the development of non-objective, or abstract art, in the 20th century. His concept of Suprematism sought to develop a form of expression that moved as far as possible from the world of natural forms (objectivity) and subject matter in order to access "the supremacy of pure feeling" and spirituality. 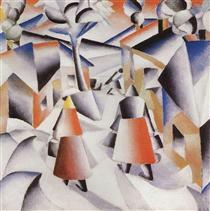 Early on, Malevich worked in a variety of styles, quickly assimilating Impressionist, Symbolist and Fauvist styles, and after a trip to Paris in 1912, Cubism. Gradually simplifying his style, he forged his distinct voice with key works that explore pure geometric forms and their relationships to one another, set against minimal grounds. 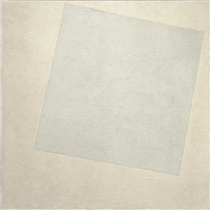 His Black Square (1915), a black square on white, represented the most radically abstract painting yet seen and drew "an uncrossable line (…) between old art and new art"; Suprematist Composition: White on White (1918), a barely differentiated off-white square superimposed on an off-white ground, would take his ideal of pure abstraction to its logical conclusion. In addition to his paintings, Malevich laid down his theories in writing, such as "From Cubism to Suprematism" (1915) and The Non-Objective World: The Manifesto of Suprematism (1926). 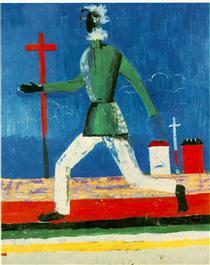 Malevich's trajectory in many ways mirrored the tumult of the decades surrounding the Soviet revolution. In its immediate aftermath, vanguard movements such as Suprematism and Vladimir Tatlin's Constructivism were encouraged by Trotskyite factions in the government. 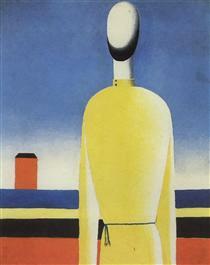 Malevich held several prominent teaching positions and received a solo show at the Sixteenth State Exhibition in Moscow in 1919. His recognition spread to the West with solo exhibitions in Warsaw and Berlin in 1927. Unfortunately, upon his return, modern art was falling out of favor with the new Stalinist government. 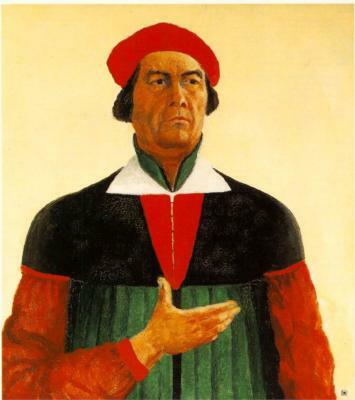 Malevich soon lost his teaching position, works and manuscripts were confiscated, and he was banned from making art; in 1930, he was imprisoned for two months due to suspicions raised by his trip to Poland and Germany. Forced to abandon abstraction, he painted in a representational style in the years before his death from cancer in 1935 at age 56. Nonetheless, his art and his writing influenced contemporaries such as El Lissitzky, Lyubov Popova and Alexander Rodchenko, as well as generations of later abstract artists, such as Ad Reinhardt and the Minimalists. He was celebrated posthumously in major exhibits at the Museum of Modern Art (1936), the Guggenheim Museum (1973) and the Stedelijk Museum in Amsterdam (1989), which has a large collection of his work. 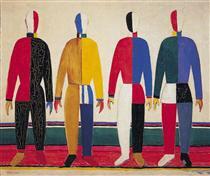 In the 1990s, the ownership claims of museums to many Malevich works began to be disputed by his heirs. In 2008, his painting Suprematist Composition sold for over US$60 million, a record price for a Russian work of art sold at auction. 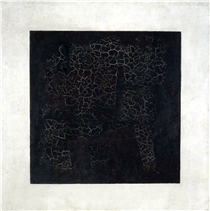 Kazimir Malevich was born Kazimierz Malewicz to a Polish family, who settled near Kiev in Kiev Governorate of the Russian Empire during the partitions of Poland. His parents, Ludwika and Seweryn Malewicz, were Roman Catholic like most ethnic Poles, though his father attended Orthodox services as well. They both had fled from the former eastern territories of the Commonwealth (present-day Kopyl Region of Belarus) to Kiev in the aftermath of the failed Polish January Uprising of 1863 against the tsarist army. His native language was Polish though he spoke Ukrainian in public. 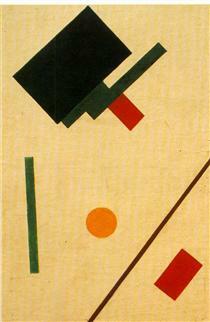 Subsequently, Malevich even wrote a series of articles about art in Ukrainian.